How fast time flies, for tomorrow is already Winter Solstice (or Summer Solstice for those Down Under). 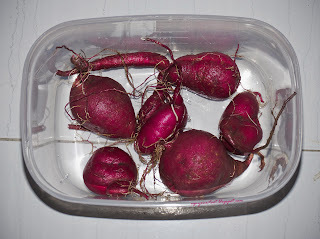 To clear up a few containers on the balcony, I decided to pull out the purple sweet potato that I planted in August. Actually, at the 2 month mark, I had already seen a tuber form in one of the two containers, but didn't bother to harvest it in November when it reached the 3 month mark post-planting. As time goes by, the containers that they were in were getting more and more distorted, and even the soil had begun to rise. 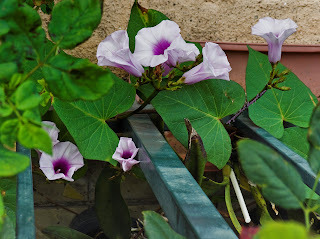 Purple Sweet Potato flowers hanging off the balcony. 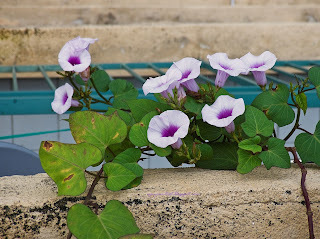 Despite the time-frame and the visual clues, I was reluctant to harvest it, for it kept on providing the balcony with lovely clusters of purple flowers that dangle off the balcony. 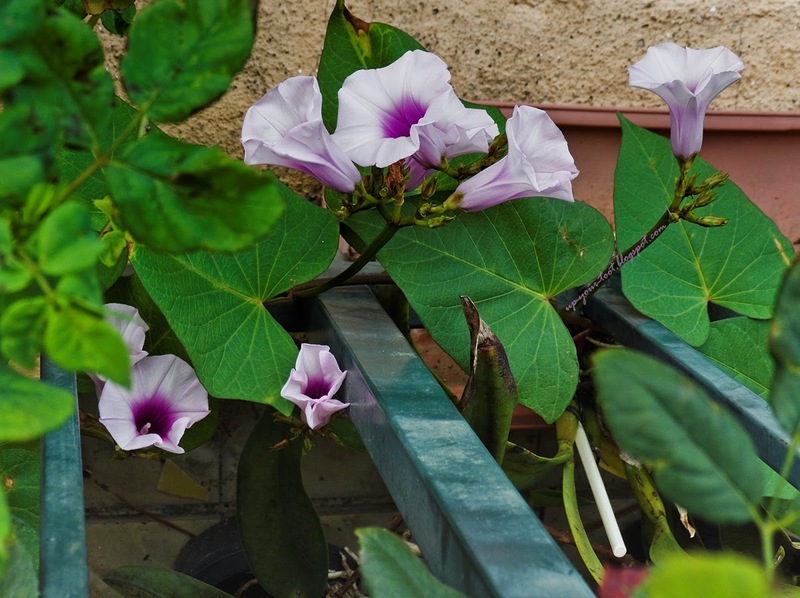 After visiting Diana at KBB, and receiving some precious seeds to plant, I got on to reorganising the plants on the balcony (hmm, sounds like a never ending process) and today, I finally got to harvesting the sweet potato. This is also to throw out the old compost that they are growing in that had a few pest issues. They are pretty good bloomers, with at least 5-6 blooms every other day! The first container that was quite severely distorted and also had soil that was lifted up from beneath yielded 4 tubers. Mind you, the containers are only 29.5cm long x 12cm high x 11.3cm at the widest (top part). 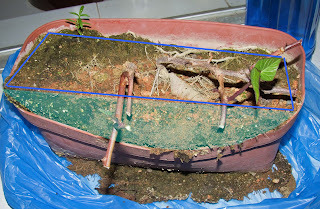 The middle section of the container is no wider than 8cm, and I had only 6 inches of soil as I filled the pot with charcoal pieces to make sure that the soil had ample drainage. The blue lines mark the original soil surface which is now tilted to one side. The lighter blue area shows the level of the soil that was lifter up off the container, and the bulge on the side of the container can be seen. Mesti ada ubi di dalam. Four oddly shaped purple sweet potatoes. The container had an inch of charcoal chips lining the bottom, thus limiting the space that is available for them to grow. 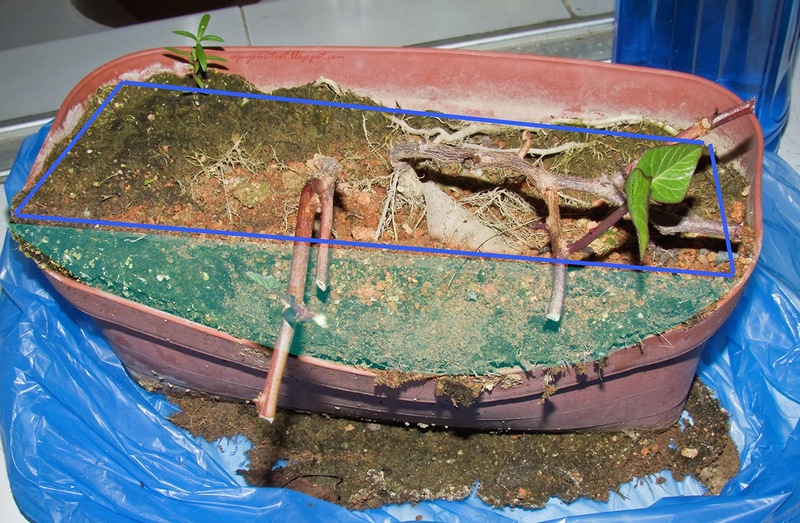 The second container also showed some distorted, but with less of a soil uplifting. 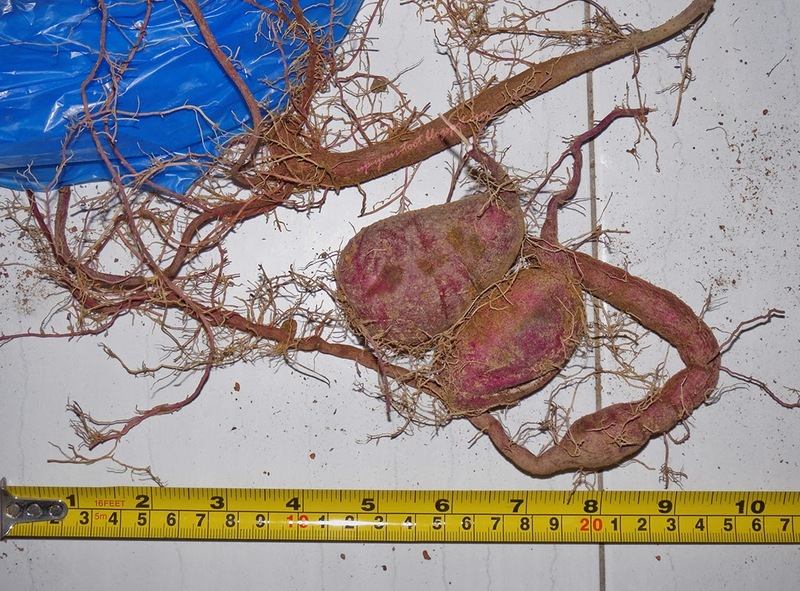 This container only gave two normal tubers, one thin tuber that is probably from a pencil root and a lot of red coloured pencil roots. The thing is, this is the container that receives more fertiliser as any excess liquid fertiliser gets dumped into this container. 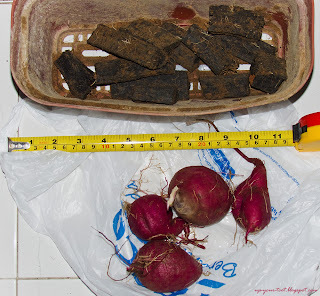 The second container yielded a whole bag of pencil and fibrous roots, plus two normal tubers and a swollen pencil root that is oddly bent like a U. That is all folks...all the purple sweet potato that I got from the balcony. Not too bad for small containers and little care other than water, sunlight and minimal fertiliser. small containers = funny shaped tubers like really flat on one side. Now to find something to cook the weirdly-shaped purple sweet potato with. berjaya dah ni... rebus pun sedap .. teringin juga tanam sweet potato ni ... space tadak ! 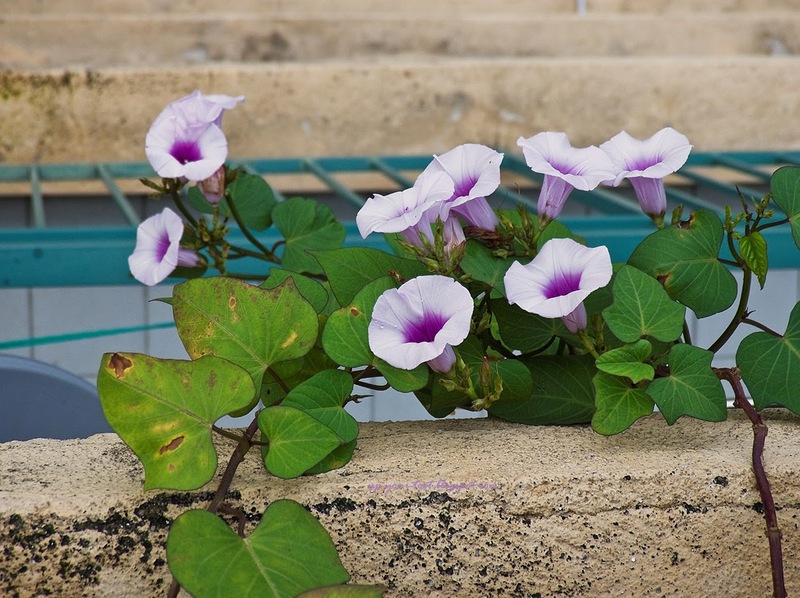 !like the purple flowers... macam morning glory kan! my orange sweet potato failed.. lack of water may be..
Tu yang sayang nak cabut sebab bunganya mcm morning glory. Kak Mar nak tak keratan sweet potato yang nih? I guna kotak kecil je. Sekarang nak try guna botol minuman, tengok ubinya boleh tumbuh menegak ke bawah tak. Kalau Kak Mar nak, I ada keratan lagi. Cuma lepas hujung minggu ni saya outstation. I will soak some kalau nak. First of all tq diatas pelawaan... rasa besar hati sangat.. at the moment dah out of space... dah tiada tempat yg sesuai untuk menyemai..
No problem Kak Mar. Nanti bila I replant balik, bila ada ruang, any time boleh ambil cutting lagi. Oh wow the tubers really pushed the container to grow. I think too much fertiliser when we grow them too much fibrous roots. Bake in oven pun macam dah sedap together with chicken. Untung the flowers are very showy mesti attract so many tengok your balcony. If winter/summer soltice dah mula meaning dekat Malaysia pun masa day getting longer again right? Kalau tanam sunchoke might not flower. Yeah, dah kembung container yang I beli dari daiso tu. Petang hari ini atau pagi esok (depends on which source you refer from) dah solstice, so hari akan semakin panjang kembali. Baru tau sunchoke are short-day flowering plants. Mesti banyak kejutan selepas balik :).